A short account of the severe sentence handed out to anarchists in Folkestone just for flyposting anti-war posters. Inspector Lawrence was on night patrol in Folkestone on the night of May 2nd 1916 when he happened upon a front page of the anarchist paper Voice of Labour posted on a hoarding in Foord Road. He then instructed his constables on night duty to find any destroy any other similar posters. 18 to 20, posted on shop windows and walls, were located and torn down. 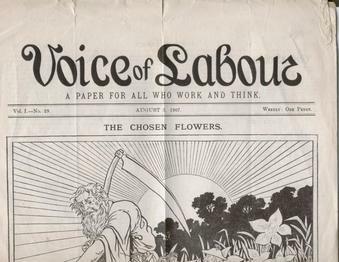 The Voice of Labour (subheading A Paper For All Who Work and Think) was an anarchist paper edited by Fred Dunn . From hiding in the Scottish hills he had written a front page article for the paper for its April issue entitled Defying the Act which called for draft resistance and conscientious objection against the Military Service Act of January 1916 which had brought in conscription. This was the poster Lawrence had seen. On 5th May the offices of Freedom, the parent paper of the Voice of Labour at 127 Ossulston Street in Somers Town, North West London were raided. This resulted in the arrest and imprisonment of two anarchists, Tom Keell and Lilian Wolfe. Among the correspondence found were copies of the Voice of Labour and a letter. This was dated April 29th and signed by one Carlo Bonfanti of Folkestone. He asked for a subscription to Voice of Labour and for the front page article which had been printed as a bill in a ten thousand run. He also requested the next issue of Freedom. In the letter he mentioned that on the previous day he had met an old school friend who had been in the Italian army and spoke about conditions there and in Italy. Excerpts from this reported conversation were subsequently reprinted in Freedom. This led the police to make arrests in Folkestone of Carlo Bonfanti and Adolfo Cavallina, both waiters at the Grand Hotel. Detective Sergeant Johnson went to 22 Alexandra Gardens where Bonfanti rented two rooms with his wife. He searched the rooms and found copies of the Voice of Labour and Freedom, as well as of the international anarchist anti-war declaration, Declaration Anarchiste in French. He also found books dealing with anarchism and an “anarchist picture” depicting a woman holding a red flag and “people of various nations”. Bonfanti was then taken to the police station. Johnson then went to see Cavallina at the Grand and subsequently searched 3 Gloucester Terrace, where Cavallina had a room. Here he found “several books” in English, French and Italian. Cavallina and Bonfanti was later interrogated by the Town Commandant. Bonfanti admitted to having copies of Voice of Labour and that he was in sympathy with it and admitted that he had asked for more to be sent. We know that Cavallina had been forced into exile in London because of his anarchist beliefs. There he worked with the noted Italian anarchist Errico Malatesta. The authorities must have been horrified on two counts, firstly because of thedistribution of anti-war propaganda and secondly because Bonfanti and Cavallina worked at the Grand Hotel, whose guests included Edward VII. At the subsequent trial at Folkestone Police Court a detective from Scotland Yard testified as to what he had discovered in the Somers Town raid. Bonfanti and Cavallina were charged under Article 12 of the Aliens Restriction (Consolidation) order 196, for contravening Article 27 of the Defence of the Realm Act. The Chairman of the Court underlined that this was a serious charge. Cecil Croft, a sixteen year old waiter at the Grand, testified that on the 2nd May he had seen Bonfanti with a packet of papers, copies of Voice of Labour, and had asked what they were. Bonfanti gave him a copy in the second floor waiters’ pantry. Next morning he saw both prisoners and asked if they had done anything with the papers. Cavallina said that they had stuck some up near the town hall. The witness then asked Bonfanti if that was right and he replied “Yes”. Croft retorted that they would get into trouble to which Bonfanti answered that it was not a serious matter, and that Cavallina had agreed. A day or two later Croft testified that he had seen Bonfanti with two ther bills and asked him if the bills were still up, to which the latter replied that they had been torn down. He agreed that he “might have” taken a copy of Voice of Labour. He had seen them on a table and had picked one up. Another waiter, 17 year old Harry White testified that he had seen Cavallina with a packet of Voice of Labour. Two days later he had seen Bonfanti with a copy of Declaration Anarchiste. Bonfanti said that he had not made any staterment in regards to disaffection. The Magistrate’s Clerk replied that the charge was distribution. Bonfanti said the statement was not his and he did not believe that he was liable. The paper had been published on the 15th and he had not received copies until the 28th. They did not leave his hands until May 2nd. The Censor had not censored any of the articles so he thought that it was fine to distribute and that if he had known it would be trouble he would not have done it as he had a wife and child. Cavallina said that when papers arrived at his address that he did not have time to read them. The Chairman of the court said in his summing up that: “The prisoners came into the country as friendly aliens, and they were received here as friends”. Everything was done for them in this country and they had abused its confidence by distributing pamphlets. “It was a very wicked thing to do and they would both go to prison for three months with hard labour,” with his recommendation that they be deported after serving their sentence. It appears that this was carried out. We know that Bonfanti was deported in August 1916 on the MV Sturmfels to Naples. After the war he emigrated to Australia, settling in Paddington, New South Wales. The Italian Fascist Consul-General Grossardi , who oversaw surveillance of Itaian dissidents in Australlia, was able to report back to the Italian state authorities on 12th August 1926 that the conduct of Bonfanti was good. This implies that he had severed links with the anarchist movement, although researchers in Australia might be able to discover more. As to Cavallina, he became a close friend of Camillo Berneri and other Italian volunteers in Spain. After the Second World War he joined the Federazione Anarchica Italiana (Italian Anarchist Federation). He moved to Nice where he was very active as a tireless distributor of anarchist literature. He died at the retirement home at Hyeres where he had lived for a year on 26th March 1972. Many thanks for writing and posting this, another sad but excellent chapter in our radical history. were the Freedom offices raided perhaps? Sorted. Thanks for spotting it, Steven.